A chimera is an imaginary animal made up of bits of other animals. It is also defined as something hoped for but is illusory or impossible to achieve. Courses at Randwick Sustainability Hub include much practical work. WHAT DO WE INCLUDE in an introduction to permaculture course? What do we leave out? How do we mix practical learning with class-time learning? How long should the course be? We puzzled over these questions. We tried different combinations until we arrived at a course of six afternoon sessions offered at different times — a weekend day, Mondays or Wednesdays so as to best fit peoples’ time availability. That has been successful. We also wanted a course that properly represented permaculture as a design system, not as a type of organic gardening. That explains our mix of topics. It also explains why guest educators take students through their own areas of expertise. As other permaculture educators have noted, few or none are the educators with the knowledge and experience to properly teach all the topics. the Living Smart course that originated at Murdoch University’s behavioural psychology faculty in Perth and which covers sustainable living initiatives in the home, then links that to action in the community. This is a localised version of Living Smart and is different to the course taught elsewhere. Students sometimes go on to the Community Leadership program that trains them to take leadership roles in their communities, organisations and enterprises. When the course are offered in the same teaching season, students sometimes participate in a couple at the same time. The education program includes other activities such as an excursion program for pre-and-primary schools in the region. Using games and other techniques, the program is designed to introduce children to how the world works and basic science with lessons in water, solar energy and biodiversity. The program has proven popular. The monthly Ecoheroes Club for 5–11 year olds offers the opportunity for children to participate in activities such as craft, art, wildlife, seed propagation, worm biology, technology, food preserving and other learning-through-fun activity. Events such as a community swap party during National Recycling Week, International Permaculture Day and the Festival of Forgotten Skills round off the annual program at Randwick Sustainability Hub. The Randwick Sustainability Hub (the name given to the community education program at Randwick Community Centre) prototypes permaculture ideas and design in a local government context. It started when funding became available to retrofit the community centre building for energy and water efficiency and build the Permaculture Interpretive Garden as a venue for the courses and as a public park. 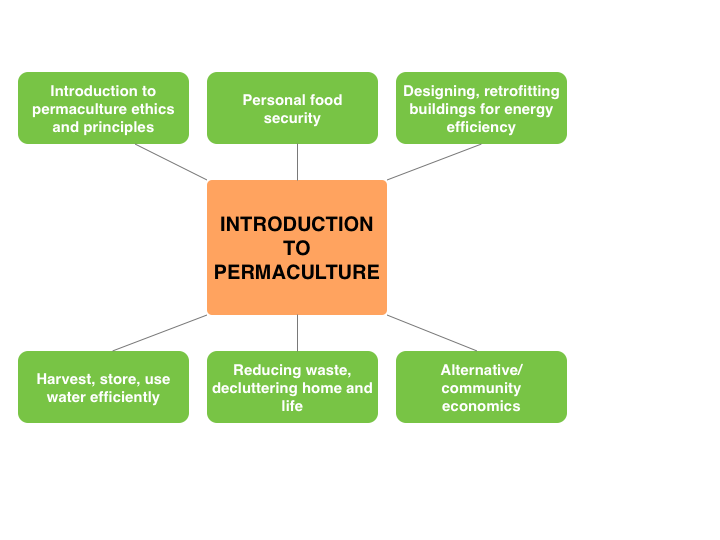 We started teaching Introduction to Permaculture at a couple community colleges back in the 1990s, at the same time we taught our urban Permaculture Design Course in Sydney. The current course is an evolution of those earlier courses transferred to a local government community education program. The community education program at Randwick Sustainability Hub provides a range of learning and participatory activities for people in the Eastern Suburbs region. A chimera is an imaginary animal made up of bits of other animals. It is also defined as something hoped but is illusory or impossible to achieve. Introductory to Permaculture courses fit the first definition. There is no agreement within the permaculture milieu about what should be taught in introduction to permaculture courses. There is no organisation in permaculture to set a curriculum and ensure it is taught. That’s because permaculture is not a unitary practice with a head office and universal agreement as to what it consists of. Permaculture is a distributed network and its hubs and nodes are independent and autonomous (see The Structure of Permaculture). What agreements exist are informal and unenforceable. This accounts for the variability in content and duration of permaculture introductory courses. Look around and we find them extending from as little as two days to sessions across a few weeks. Content is equally varied. Some appear to be little more than courses in organic gardening plus some permaculture design concepts, its ethics and principles. Others more fully represent permaculture as a design system. That is the aim of the Introduction to Permaculture course at Randwick Sustainability Hub. As a component in a nested series of short courses, the purpose of the Introduction to Permaculture course is to familiarise participants with the permaculture design system and to enable them to adopt practices to become more resilient to economic, social, political and environmental change. The courses are open to people from other local government areas on the grounds that we all live in the same city and we face many of the same challenges that require many of the same solutions. Challenges do not observe local government boundaries, so neither should solutions. Russ Grayson (the author of this article), a journalist who ran urban permaculture design courses with Fiona Campbell and who is interested in the intersection of technology, economics, politics and permaculture. The course blends classroom and outside work. Much of the classroom content is also practical in that students handle materials and engage in hands-on activity. The Randwick Sustainability Hub’s community centre building, the Classroom building and the Permaculture Interpretive Garden, all on-site, demonstrate the course topics. The content of the Introduction to Permaculture course has been refined over time and provides an introduction to permaculture as an integrated design system. Here’s the current course structure derived from years of trialing and prototyping ideas. It is not fixed and is tweaked according to student needs and to changes in the environmental/economic/social context. Introduction to permaculture’s purpose, ethics and principles. •obtain a yield and use and value diversity. Sector and site analysis + zone planning for the home and community garden. Principles and technics of home/community gardening. Alternative food sources for those who do not garden: food co-ops, CSA (Community Supported Agriculture), organic buyers’ groups, multifarm home delivery services — all part of the alternative economic structure. Solar design principles and strategies. Building materials and products that can be repurposed, reused, recycled. Embodied energy in building materials. The energy and water-efficient, retrofitted community centre building and the Classroom building are used for demonstration. Water harvesting, storage and reticulation systems in the energy and water-efficiency-retrofitted community centre building, the adjacent Permaculture Interpretive Garden and the public reedbed (artificial wetland) toilet system are used for demonstration. Week 5 — THERE IS NO SUCH THING AS WASTE (with waste educator Alexandra Bastos) + DESIGNING YOUR HOME AND LIFE (with permaculture designer Cecilia Macauley). decluttering your home and life with Cecilia Macauley: the principles and practices of convivial minimalism and home organisation; how to declutter your life. understanding and working within the big picture context: how we got here — the Great Acceleration into the Anthropocene; what can we do where we live about the changes now becoming apparent? a big picture appreciation situating participants and permaculture in the world as it is now, how we got here and where to now in the time of the Anthropocene. 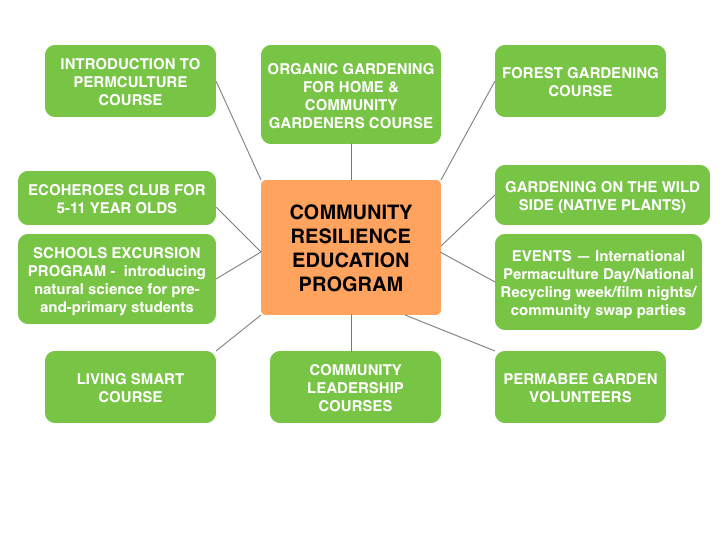 The course complements the Organic Gardening and Forest Gardening courses, both adapted to the scale of home and community gardens in the Eastern Suburbs, and the Living Smart course that focuses on personal and community initiatives in life, home and neighbourhood improvement. 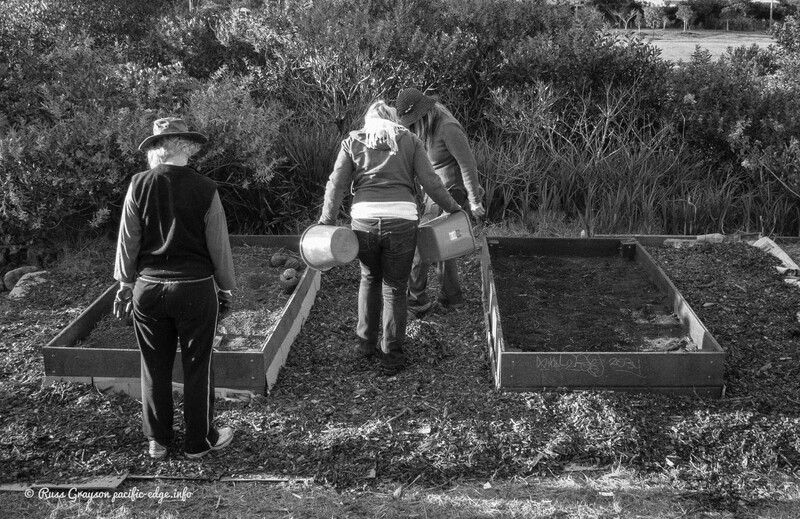 When Fiona started working on the community resilience program she decided not to offer the permaculture design course because there were a couple course providers offering that course in the Sydney region. Offering a free permaculture design course could have affected their livelihoods. The introduction to permaculture course is a sampler of the permaculture design system and for those inspired a stepping stone to the design course. It must be into the four figures, the number of people who have gone through the Introduction to Permaculture course, many of whom have gone on to do other courses on offer. For Fiona, that accomplishes the permaculture principle of ‘obtain a yield’, the yield being people taking action to improve life in their homes and communities.